Common Jassid is one of the largest size in the Eurymelinae. We also like to call them Large Gum-treehoppers, The adult is brown and dark violet under sunlight. There are some white spots on its wings. 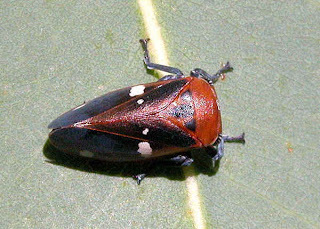 Nymph has the reddis-brown body with black markings. 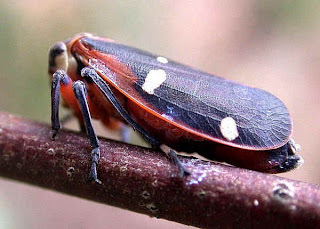 Gum-treehopper sometimes called Jassid because they were classified as family Jassidae before, then now the Cicadellidae. All treehopper species have five instars and one adult stages. They will become adults very soon. Usually there is one generation per year.They are slow moving, usually run aside when disturbed. The nymphs cannot jump. 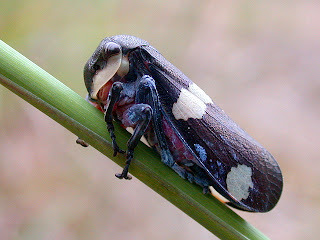 The adults may jump and fly away when touched.Adult with brown eyes and powder pink abdomen. 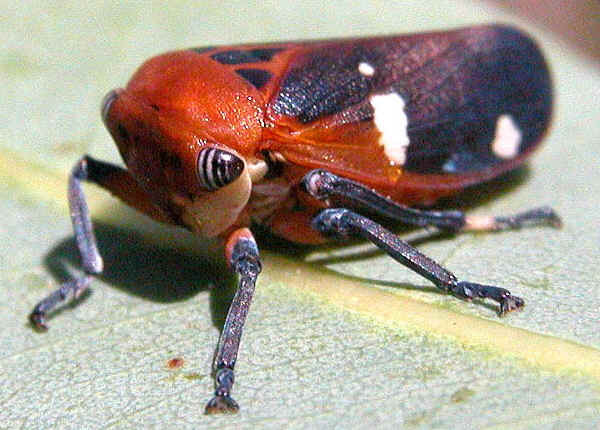 Their body colours vary quite a bit between individuals.